Flying into the delta from Maun airport in Botswana gives you all the perspective you need. You are arriving in a land that belongs to nature, a true representation of the wonders of the wild. I woke up every morning with the noise of the African bush and the fresh sweet smells of nature. During my trip we spent time in very different regions of the delta and I was mesmerised by the uniqueness and beauty of each. The tranquil waters of Little Vumbura camp are the perfect way to connect with the Delta’s great water source. This camp immerses you, sunsets by boat and mornings floating silently across the crystal clear waters in mokoro’s. I loved the Mokoro – being gently polled across the water as our guide shared his traditions with us, showing us the tiny jewels of the Delta. Sighting highlights : On our way back to camp we spotted a male lion relaxing next to Tent 6 close to the waters edge. This same lion had been all over our camp the night before stalking the resident Lechwe. It was exhilarating to see him from the water. At Qorokwe camp, you settle into your environment, the warmth of the camp from the interiors to the people, everything makes you feel right at home. Nothing is too much trouble here. Breakfast over-looking the camps main water hole as the sun slowly creeps over the horizon, sets the perfect scene for another day in this wild land. This camp is the ‘new kid on the block’ , situated in a predator rich area in the Delta. This new look camp is located in one of the most action packed regions of the Delta and is one we are particularly excited about. A beautiful, upmarket camp with the wildlife to match the quality of the lodge experience. There are several different habitats to explore and this mixed vegetation brings with it diversity and action. Sighting highlights: Sharing sundowners that evening with a bull elephant at a shallow water hole was my priceless moment. To be on foot with these gentle giants, with only a few meters and shallow water between you is an exhilarating feeling. He was acutely aware of our presence but in no way threatened as we enjoyed the fires in the night’s sky together. At Little Mombo we were treated to some of the best this remarkable island has to offer. Dinner under the stars, on a deck over looking a dry flood plain, alive with the nocturnal bush life. It’s hard to picture the transformation that is currently occurring. In a few short weeks the flood waters will arrive and there will be water as far as the eye can see. Chiefs Island is a magical place, the views are alive. With the recent rebuild of both Little Mombo and Mombo main camp my trip was perfectly timed. The new look is stunning with finishes grounded in nature and sprinkled with luxury, it has the perfect mix and naturally immerses you into your surrounds and the finer things in life. No wonder it’s one of the top wildlife experiences and lodges in Botswana. Sighting highlights: We were welcomed to chefs island, a true Garden of Eden, by Jacob a critically endangered Black Rhino. Our Interaction with him gave me goosebumps while we sat in awe of this gentle creature as he calmly investigated us several times. The morning was not going to disappoint… keeping with the theme of rare sightings, Yompy our guide, listened to the sounds of the bush and translated back for us. Before long we found ourselves in the middle of a high speed Wild Dog hunt. Wild Dogs are a well-oiled hunting machine; they are strategic and communicate with each other constantly to make adjustments as they need to. This Pack of 11 was fascinating to observe in all their behaviour that morning. I knew how rare this time was and soaked up every minute. This island is full of treasures most will never encounter. It seems to be a place where time has stood still for nature, where all beings respect the cycle of life. 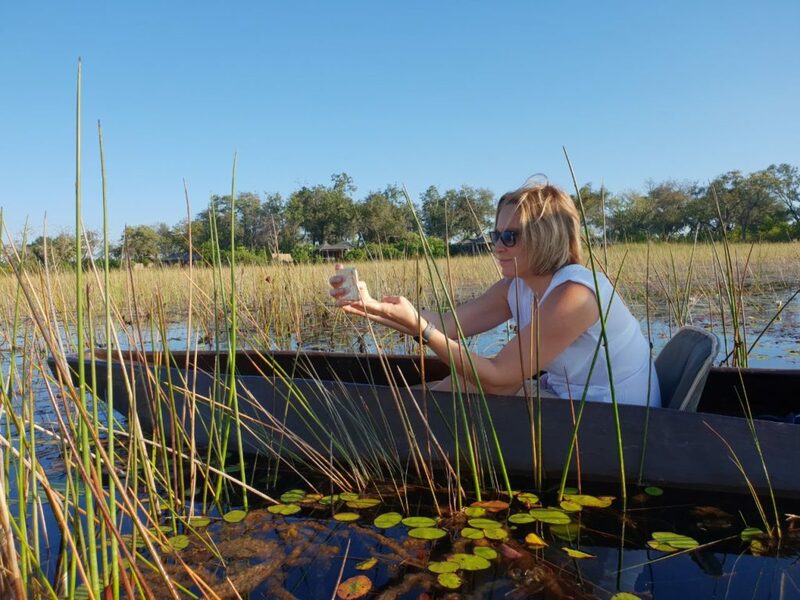 The Okavango Delta has a healing way about it, you ‘switch off’ without even realising it. Sometimes we need to be unplugged so we can really recharge. If the Okavango Delta is not on your bucket list… it should be. Ahhhhh! I loved this piece and these photos are amazing. Sounds like paradise Sam! Thanks for sharing this beautiful experience. WOW!! !